The pace of existing home sales increased in December, but remained below that in the same month of the previous year. Home prices declined as we moved in to the cooler months, when seasonal declines in both prices and inventory are normal. Inventory dipped slightly and remained below last year’s levels as well. The year-over-year drop in sales pace is due largely in part to the continued decrease in inventory across the county. Anticipation of a continued drop in mortgage rates may also have played a role, as rates have continued to decline despite having already dipped below the previous year’s rates. 30-year rates have continued to dip after moving below last year’s rates. Concerns about global growth and uncertainty around other global events have continued to put downward pressure on interest rates. 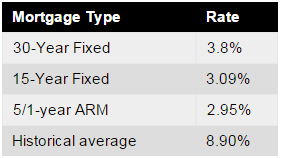 Currently, Freddie Mac reports the following figures: 30-year fixed rate, 3.80%; 15-year fixed rate, 3.09%; 5/1-year adjustable rate, 2.95%. The seasonally adjusted annual rate of existing Queens home sales rose to 732 homes in December. This was a 14.7% increase from the previous month but was still 8.7% below the rate of Queens home sales from December of the previous year. The year 2014 has been a solid year for existing home sales coming off of the previous year’s jump in both sales in prices but we have seen year-over-year decreases for nine consecutive months since April of 2014. We look for 2015 to be another solid year for home sales because demand is high and the rate is still very low, however, this is only if more inventory finally hits the market. 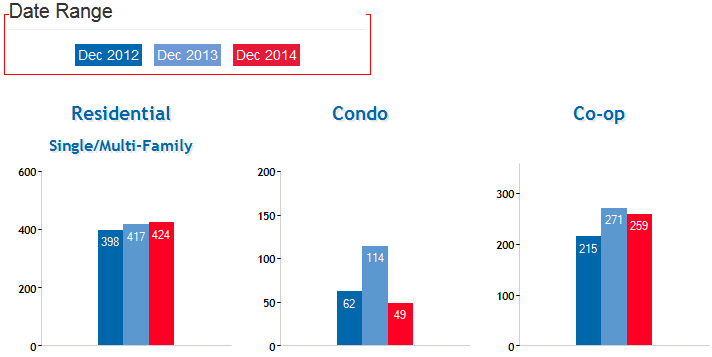 Residential home sales are up .7%, Condo sales are down 57%, and Coop sales are down 5.2% from this time last year. The median home price in Queens was $403,500 in December. This was a 3.9% drop from the previous month, but is still 6.9% up from the same month of the previous year. In 2014, we’ve seen housing prices return to sustainable growth rates in the 4-6% range. This pattern will likely continue in 2015, with some potential for slightly slower year-over-year gains, depending on how inventory and new home construction develop next year. Residential home prices are up 11.3%, Condo prices are down 5.6%, and Coop prices are up 10.2% from this time last year. The number of homes available decreased 11% from the previous month and decreased 23.4% compared to the same month of the previous year, with 3,978 Queens homes available for sale in December. This translated to 5.5 months of supply, as the slower sales pace moved in line with inventory levels. As we move into the cooler months of the year, we will likely begin to see inventory continue to tighten slightly.